Acupuncture is a form of treatment where the acupuncture needles are applied at specific acupuncture points. These acupuncture points belong to our body's internal organ pathways which are called meridians or Qi (Chi) energy path ways. Acupuncture is a form of treatment where the acupuncture needles are applied at specific acupuncture points. These acupuncture points belong to our body's internal organ pathways which are called meridians or Qi (Chi) energy path ways. Acupuncture needles penetrate the skin into the tissue layers. The acupuncture needle is then manipulated in such a way by the acupuncturist to achieve a Qi sensation. The patient will experience this sensation once the acupuncture needle has contacted the correct acupuncture point. Stimulation via acupuncture needles then directs the body's own internal regulatory mechanisms to bring back a proper balance or to unblock blockages of the body's energy pathways. Acupuncture is an ancient form of treatment but like all other treatments and developments, acupuncture has come a long way since then. Here at Harmony Chinese acupuncture Melbourne we can also apply a needle free acupuncture treatment. The philosophy is the same but this treatment is just without acupuncture needles. This is a great way of applying acupuncture for those who dislike needles. Sciatica, Digestive Disorders, Headaches, Tennis Elbow, Sports Injuries, Coughs, Flu, Asthma, Joint problems, Arthritis, Hay Fever, Lack of Energy, Menstrual Problems, Fertility aid, Tinnitus, Back Pains, Neck Pains, Shoulder and Elbow Conditions, Pain, Quit smoking and much more! Harmony Chinese Medicine Acupuncture Melbourne is equipped with the latest technology combined with ancient Chinese Medicine philosophy. Because we have an indepth understanding of the human anatomy and physiology, acupuncture is applied precisely and accurately. At Harmony Chinese Medicine Acupuncture in Melbourne we treat the body as a unit, each is treated as an individual. What to expect from a Chinese medicine and acupuncture treatment? You will firstly be seen by one of our experienced Chinese medicine and acupuncture doctors. The first visit can last from 45 minutes to 90 minutes. The doctors will gather information thoroughly from you via the signs and symptoms that are presented and applying the ancient art of pulse and tongue diagnosis as an aid in diagnosing the actual cause. The treatment is precise and individual because every patient is different. The doctor will then treat you accordingly with either acupuncture, Chinese herbal medicine (which is tailored to the individual) or a combination of both depending on the case that is presented. The use of acupuncture and herbal medicine together is a preferred treatment plan as that will assist in the progress of healing. At the same time the doctor will advise you on dietary and lifestyle changes, which are very important pathways in achieving a harmonious balance within the body. What do I expect from an acupuncture treatment? Acupuncture needles penetrate the skin into the tissue layers. 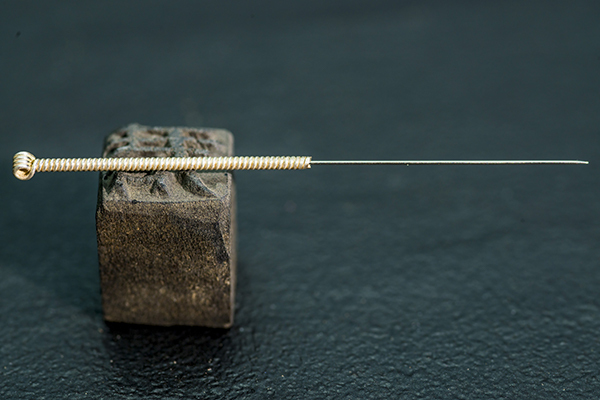 The acupuncture needle is then manipulated in such a way by an acupuncturist who will tweedle with the acupuncture needle to achieve a Qi sensation. The patient will experience this sensation once the acupuncture needle has contacted the correct acupuncture point. Stimulation via acupuncture needles then directs the body's own internal regulatory mechanisms to bring back a proper balance or to unblock blockages of the body's energy pathways. Although acupuncture is an ancient form of treatment, like all other treatments and developments, it has come a long way since then. Here at Harmony Chinese Medical Centre Pty Ltd Centre we can also apply a needle free acupuncture treatment. The philosophy is the same but this treatment is just without acupuncture needles. This can be a great way of applying acupuncture for those who are scared of needles.